One of my favorite parts of the Gallifrey One Convention in Los Angeles is the chance not only to hear your favorite stars talk on panels, but also for a nominal fee, to meet and take photos with them. Daniel and I have done this several times over the years, and this year was no exception. Our three photos were with Sixth Doctor, Colin Baker. This completes our collection of Classic Doctors 5-8 who have visited the convention. I wish Tom Baker made an appearance as that would allow me to have a photo with all of the living Classic Doctors, but I have his autograph from when I visited Cardiff in 2007, so that will have to do for now. Next up were Arthur Darvill (Rory Williams in Series 5, 6, and 7), and Billie Piper (Rose from Series 1, 2, and 4). Both are very popular companions from the revival show that began in 2005. Both were very nice to us as we took the photos and Billie was a trooper since she had the flu. We were able to get all three prints autographed at the convention, and I am still waiting for the digital copies to arrive in my email so I can post them for all the world to see. The rest of the weekend was great as always. This year I got into ribbon trading. Most people like to have ribbons at the bottom of their badges and this year I decided to buy some so I could trade to potentially get more back. I made 100 of them and ended up trading about 80 and getting back about 30 on my ID. Still way more than my previous record of 6 from last year. Not sure if I want to invest again in ribbons due to the return not being that great, but I have another whole year before I have to worry about it. See you next year, Gallifrey One! This entry was posted in Celebrity, Entertainment on February 16, 2014 by clubjosh. It’s Almost Gallifrey One time! Next week is the North American Doctor Who convention, Gallifrey One! This will be my 6th consecutive convention – a record for convention going I think going back to my 1980s Star Trek convention days. I really love the convention, even though sometimes I feel like an outsider since I don’t mingle as much as I want. I’ve always seen some friends from work at the conventions and then of course the “regulars” that we see every year. As Doctor Who has grown in popularity, planning for the convention has had to begin almost as the last one ended. I was able to snag tickets before they sold out and this year we are staying two nights at the hotel so to be in the mix. Last year we stayed over on Saturday night and it really was great to not have to drive home after the events on Saturday. In an effort to force myself to interact, I’ve purchased some convention ribbons to hand out and trade with other attendees. Also for the first time I have pre-ordered my celebrity photo booth times so I can have more petty cash on hand at the convention and hopefully get some more cool dealers room items. Just over a week to go! Can’t wait! This entry was posted in Celebrity, Entertainment on February 4, 2014 by clubjosh. 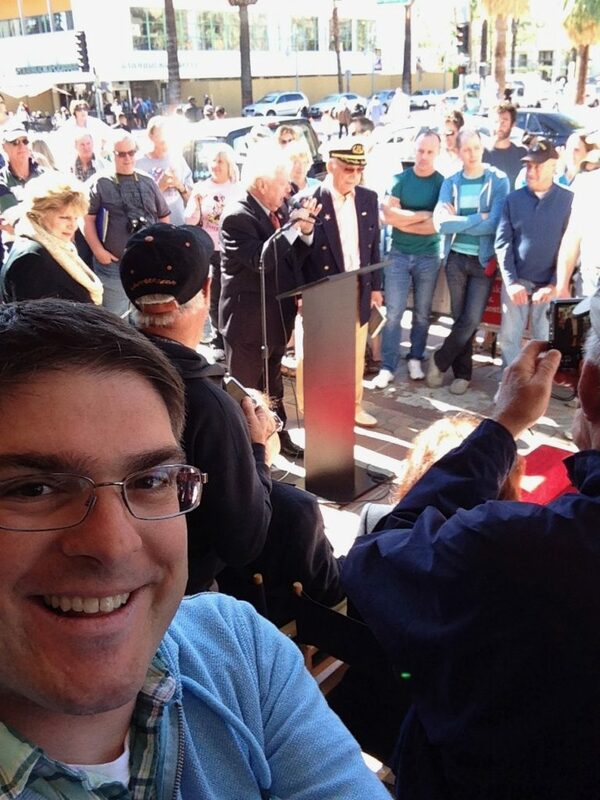 Ran into Gavin MacLeod getting his star in Palm Springs! Carol Channing and Peter Marshall were here too!! This entry was posted in Celebrity, Photos on February 1, 2014 by clubjosh. A lot of people are born on January 20, among them Doctor Who’s Tom Baker who turned 80 today and is getting a lot of press from the Who fandom and web sites. So while I certainly wish my Doctor a Happy Birthday, I wanted to focus on another Doctor in my life, DeForest Kelley who played Dr. McCoy on Star Trek. Longtime readers know that I like all things Star Trek, but there is a special place in my heart for the original series. It was the one I grew up with (TNG didn’t appear until High School) and the one I spent hours and hours watching and memorizing the episodes. Shatner and Nimoy get most of the press from TOS and arguably have had the most success post-Trek. But Kelley’s Dr. McCoy was the third anchor of the trio at the core of the show and the perfect balance to Spock and Kirk. Some of my favorite lines of his are also popular with the masses – “He’s Dead Jim” and the “I’m a Doctor…” series of quips never failed to make me smile. People tend to forget though that he did a lot of the emotional heavy hitting – making the other two see the emotional consequences of our heros actions. There were not a lot of “McCoy” episodes, but I think his finest hours were when he was checking in on Kirk and begrudgingly paying respect to Spock. I think his roles in the Original Series movies were his best work – Calling out Kirk in TMP, the “Jim!” on Regula 1 in TWOK, carrying around Spock’s Katra in TSFS, “Don’t Bury Yourself in the Part” in TVH, the scene with his dad and “How Come You Don’t Know Row, Row, Row Your Boat” in TFF, and a good chunk of his work in TUC. Thanks for all the memories you gave us De, even your bit part in The Brave Little Toaster Goes to Mars, your last role. This entry was posted in Celebrity, Entertainment on January 20, 2014 by clubjosh. Happy Birthday Charo! Still rockin’ after all these years! This entry was posted in Celebrity, Entertainment, Photos on January 15, 2014 by clubjosh. 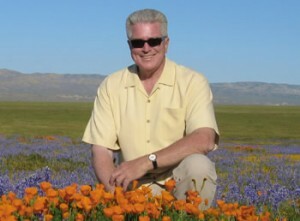 Today is the one year anniversary of Huell Howser’s death last year at the age of 67 from prostate cancer. 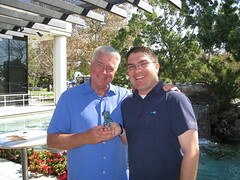 I’d always loved Huell on TV and I was glad to meet him with the Gorn back in 2009 at a AAA Travel Show and again in 2010 at the LA Times Travel Show. When I was a teenager (and let’s be honest even today), I always wanted to have the sort of show like Huell where I got to travel all over give travel advice to people and do interviews and such. I just wish I was as enthusiastic as Huell. There is no better way than to honor him than to watch some Huell Howser! I’ve selected some of my favorite episodes and links to watch whole or partial episodes online. Newberry Springs – This is one of the first “Road Trip” episodes he produced. The Calgold.com describes the episode this way: “After seeing a web site devoted to all the great cultural and historic sites to see along the original Route 66 in the Newberry Springs area, Huell prints out the map and hops in his car – eager to start his next ROAD TRIP. He doesn’t find the Buffalo Ranch, Big Al’s Pistachio Plant, or the Ostrich Farm he was looking for, but Huell does meet a group of warm, interesting and generous Newberry Springs locals. And, after spending a day there, Huell discovers firsthand that the beauty and strength of a town, any town, is not in the number of its attractions or tourist stops, but in the friendliness and character of the people who call it home. As always, you’re invited to come along for the ride… its gonna be a great trip!” I don’t think this does the episode justice! The Corners of California – I love it when Huell sets out to visit a series of somethings (like the California Missions series) and the Corners of California series did not disappoint. My favorite two episodes are the North West Corner where Huell discovers that a shop is technically in California and not Oregon and the North East Corner where they wander around hiking for a few hours trying to locate the monument. One special note is that the Geographer with Huell is actually the husband of my Cartography teacher at UCD. Another Huell specialty is food – he loved to visit places to eat and two of my favorites are the Donut Man in Glendora (where we used to get donuts as kids) and In-N-Out where I still eat today! Sadly the In-n-out episode isn’t online, but you can see a preview on YouTube and even here Huell sing the In-N-Out song which I have as a ringtone on my phone. There are so many episodes that are wonderful and these are just a few of my favorites. You can watch many many more at the wonderful Chapman University Huell Howser Archive (Huell donated all his shows and even the Volcano House he owned near Newberry Springs to the university before his passing). I also encourage everyone to check out his YouTube page which has some great treasures of the pre-California’s Gold era with Entertainment Tonight and as a reporter in Nashville. Finally, don’t forget to visit CalGold.com which has all the information about his episodes, links to donate to the California’s Gold scholarship, order DVDs of shows, and much, much more. This entry was posted in Celebrity, Entertainment on January 7, 2014 by clubjosh. Truly one of the greats! It was an honor to meet Huell today at the Costa Mesa AAA Travel show. We chatted about UC Davis when I told him I graduated from there and enjoyed his show. I also told him I loved the show where he found the corners of California, but neglected to tell him I was thisclose to his hometown of Gallatin, TN. Probably for the best. Right before we took the photo, he told the crowd, “It’s getting weird towards the end of the line!”. Those of us who waited over an hour in line chatted about our favorite episodes and laughed whenever we would hear him exclaim, “Wow!” to one of the people ahead of us in line. This entry was posted in Celebrity, Travel on October 24, 2009 by clubjosh. Josh with Marty Sklar on July 17, 2009. This was the day Marty chose to retire from the Walt Disney Company and was honored with a window on Main Street USA on City Hall. It was a great pleasure to help Marty back to his car after the ceremony was concluded. This entry was posted in Celebrity, Disney on July 18, 2009 by clubjosh. This entry was posted in Celebrity, Entertainment on April 10, 2009 by clubjosh. Josh at the Price is Right!